I saw my education pay off in Fairfield Society debate tonight. In the discussion following the talk on the compatibility or contradiction between Christianity and Capitalism, I caught a flock of logic fallacies and followed one economics major shifting between two contradictory positions (psychological egoism and ethical egoism) depending on the success of the argument. What a difference a semester in a good class makes. I knew he was doing the shifting though I had done the same thing a year ago, and I understood both positions and understood that the one—psychological egoism—is unfalsifiable and explains little about the world. Ahhhhhhhhhhhhhhhhhh, the pleasure of knowledge and the joy of watching my education work. Wherin, Seraphim and Silliman go a few rounds, in a gentlemanly fashion, on the subject of tradition, education and literature. Seraphim contradicts my Kerouac post, sort of. He doesn’t like Kerouac—but that certainly is not a reason to cull some writer from the canon, which he recognizes. He told me that he likes Kerouac, though less now than he used to, but doesn’t think he should. I certainly don’t endorse the man, or support the style, but he’s influence and importance should not be brushed aside because of bad ideology. Seraphim then takes a swing at my anti-traditionalism. I am, of course, “pushing post-modern art again.” My post-modern artistic sympathies have been overblown—by me, by my detractors and by my defenders—mostly for stylistic reasons. Pitting Homer against Kerouac is not a dichotomy I erected, nor is it one I support. But, time passes and knowledge accumulates (even Kirk, the conservative, would agree with me) and some things pass from the syllabus to be replaced by the new knowledge. This is a competition—one Time judges—and the great remains. Today we do not study the Civil War in a general education as much as it was studied in 1870. We have made room for World War II and modern affairs have changed our education. This should be equally true of literature but, for various reasons, English majors (among others including Philosophy majors) of a conservative stripe are too happy to sweep aside all modern events, influences and affairs as, alternately, irrelevant drek or destructive trash. The best point Seraphim makes is made when he turns to the poverty of the education. Even the writers the students are familiar often amount to passing familiarity. Thus, part of the problem in the debate over the canon is the limits of the syllabus and the classroom. If students pursued literature as a personal endeavor and not as a class project, they could expand their knowledge and they could explore the wilder writers with the riskier projects, the recent works that has not yet been anthologized by Norton and the work that has fallen from the anthologies to make way for new material. No modern individual should claim to be educated without knowledge of the works of Homer, Pound, Elliot, Kerouac, Dante, or Shakespeare. But neither should any modern person claim to be educated if their knowledge is limited to material covered by in syllabi and classrooms. A part—perhaps the part—of the liberal arts education is to teach the student to educate themselves. Pass beyond the classroom—learn the breadth and depth of the world. Give us Homer and Kerouac and let us pass beyond the classroom. Open Embrace: A Protestant Couple Rethinks Contraception. A new book on the topic of Protestants and birth control looks really good. The authors were interviewed by Christianity Today a while back and it sounded like an intelligent and well grounded work. This is an exciting book and I expect it will some enter into the Church's debate. I hope to read this soon. Catholics would do well to take a look at this for their arguments certainly need some shoring up--though no Protestant church has yet offered a sound alternative. Seattle: poised to replace New York and save the media from itself. Slate, the online magazine, is moving east—deserting Seattle and reasserting the primacy of New York City. NYC has formed the center of the publishing for a long time. NYC formed the center, the news nerve system, the heart pumping everything everywhere else. The New York Times, every TV network’s headquarters (with the exception of Ted Turner’s CNN in Atlanta), all the major magazines, all the book publishing houses, all the advertising agencies, all of everything. This has received a little competition from D.C.—in political affairs—and L.A.—for entertainment. But, for all practical purposes the publishing world always sets its clock by NYC time. This has led to a narrowness in the industry that could have and should have been avoided. NYC set the agenda. NYC was normalcy. NYC was where it was. Except it wasn’t. Because of this the media world thought it was they missed stories, misunderstood stories and made up stories. The Internet could have changed that. Seattle—the center of technology, the dot com world, the beginning of the information superhighway—had the chance to compete with NYC. Slate’s move is either a sign that nothing has changed, or the change is still coming and Slate has just missed the boat. I hope the latter is true. I don’t care about Slate but I do care about the state of the publication world. Atlanta had the chance to steal the future from its NYC arrogance and failed (read Tom Wolfe’s book A Man it Full). Chicago once had the chance and also failed. Today Seattle has the chance. The future could be based in Seattle. Seattle was where America was reinventing itself. Seattle, my home stomping grounds (though I stomp all up and down my West Coast), has the potential of replacing NYC. Seattle is a pretty city, with technology on its side. Without the past of an older city, Seattle—young and new and prosperous and full of potential and ready for the future—is new and hip and sweet and full of potential. Sure it has problems. It hasn’t yet had the time to sort itself out. Seattle is new and the home of information technology is poised to take the lead away from NYC. Dear Slate, help save the publishing world from itself, from its NYC attitude and from lack of competition and diversity. Go west young media. Move back to Seattle: It is a tremendous city and it is poised to take the future. A student told me yesterday that he wrote in stream-of-consciousness style. He didn’t. In fact, he didn’t know the difference between writing something easily and quickly and stream-of-consciousness. I guess this illustrates my problem with the manifestation of the “great books” philosophy. It is held by conservatives who want to say that old equals good (“test of time” or “wisdom of the anchients” or some such thing) and that the new does not compete. Generally those with such an education ignore the most current literature. The problem with this is that the modern stuff—even if it is drek—is an expression of modern, that is current, philosophies that we live with. I was telling the fellow student about spontaneity and described Jack Kerouac and On the Road and stream-of-consciousness spontenaity. This was a smart student who would have been familiar with references to Aristotle or Dante or Shakespeare and the significance of their work but was ignorant to modern writers who have influenced the way we think and write. Even if we insist on stolid conservatism—decrying all writers of the modern and post-modern and post-post modern age—we cannot ignore writers we don’t like. They changed our world and have thus we should honestly explore their ideas and the reasons and significance of their work. Check out the above link as part of your "great books" education. It is an interesting look into the style and form of writing by Jack Kerouac. 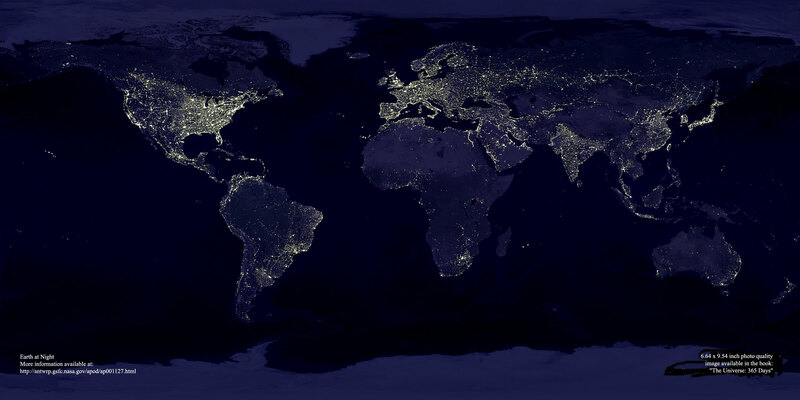 This is a very sweet picture of the earth at night. Thanks to The Blogfather for the link. Hillsdale College has entered into an advertising campaign. They have an ad on the front page of National Review Online, for the college and they have an ad in the paper edition of National Review for the Academy’s grade school and high school program. Seraphim takes the school to task for the online ad on a few points. The ad misrepresents part of the school’s history and makes political appeals to a political audience rather than making an appeal on the basis of education. Why should Hillsdale College present itself purely in a political manner? The daily success of this school is not dependant on its political leanings but the academic excellence of professors and students, and its reliance upon the so-called “great books” and “wisdom of the ages.” On Thursday morning, reading Homer and Kant and Dante directly benefits me as a student. Hillsdale College’s political affiliations and persuasions, as important as they are, isn’t truly the stuff this college is made of. The ad in the paper edition of the magazine, an ad for the program and the curriculum of the academy, is more aligned with something I would like to see. The ad is ostensibly a seventh grader’s test (in Mrs. Wolfram’s class) on the subject of Rome. The test asks students to place seven rulers in chronological order, evaluate the rulers, define a few simple Roman phrases (Pax Romana, papyrus), write on Roman education and entertainment, the fall of the Roman empire, the rise of Christianity, and the legacy of the Roman Empire in its contribution to the Western world. The ad is good in idea, but it didn’t work out well on the page. It is awfully arrogant. Hillsdale Academy isn’t the only place such an education is offered nor is it the best possible education. The administration has recently made moves to ease the requirements of the education—lowering the standard and moving away from a classical education. My recommendation to the school is to play up the liberal arts—the reading material of the Hillsdale freshman compared with the reading material of a freshman at a state school would be a good graphic example of the advantages of this school—and to play down the arrogance. Don’t pretend that everybody learns Latin or that all Hillsdale College students are brilliant or that this is the best education given anywhere. Because of this story on a frat fight that turned personal and violent, the dean of men has called me a leach. It was a story that needed to be written and I believe I did the best I could under the circumstances of few sources and tight deadlines. I guess if Socrates was a gadfly then I can be a leech. I’m getting more and more annoyed with the Greeks on this campus. Right now some of them are in the street screaming and blocking traffic. The cars are lined up for a block and about half of them are honking and the Greeks are screaming and I wish we didn’t have a Greek system and these imbeciles would go to a state school. Notice the additional links I've added, thanks to a piece run by Razor Mouth. I especially want to direct you towards the Schaeffer site. The late Francis Scaeffer is probably the man I most respect and hope to emulate. I am currently working my way throuhg his complete works. This site reproduces a lot of his shorter work in a highly professional, attractive and modern way. A job well done and, I believe, an invaluable resource. I'm reading some of the poets in the Modernism section of my Norton's Anthology of Wold Masterpieces (seventh edition), mostly reading T.S. Elliot's The Wasteland for the first time. I am quite impressed. Elliot and his poetry are certainly the mother of Dylan Thomas and Ginsberg or Duncan, poets that I have read and particularly enjoyed. I understand only a slight sliver of what is being said--it would probably take week to unravel some of these passages--but the imagery and the form of this poetry is awesome. And voices singing out of empty cisterns and exhausted wells." Elliot is awesome and I don't even know what he is saying. Reading one piece by Yeats. I'd looked at The Second Coming before--a professor pointed it out when I was writing a paper on the mixture of paganism and Christianity in Dylan Thomas' poetry--but I loved it again when I read it tonight. Slouches toward Bethleham to be born?" I think I am going to attempt to read Pound's Cantos on the bus ride home. I was sitting in a small-town, Midwest courtroom wearing a red tie at 8:35 a.m., Wednesday. I’m not used to wearing a tie on weekdays—I just don’t have to—I’m not used to being somewhere at this time of day, and it’s been nine months since I’ve been in a courtroom. We've been reading Tom Wolfe's Radical Chic and Mau-Mauing the Flak Catchers for journalism class, and talking about his New Journalism. Going over it this morning, I wondered what connections could be drawn between his style--personal, outrageous, etc.--and the blogging style. A paper is due in that class tomorrow, maybe I'll pull something together on the subject. A woman started the fight that broke out between two fraternity members—a Sigma Chi and an ATO—that has led to an assault and battery charge. Apparently the woman is being dated by the ATO and the Sigma Chi used to be interested in her. A rude comment, hurt pride, a women—real original stuff. a history of not ulfilling their obligations to landlords (I'm not talking about Israel here, but that too) and because they aren't wanted in rental neighborhoods. How sweet. Read the story here. Another interesting article on Blogging, with previews of some of the popular blogs. Also we have some interesting developments in blogdom. A book is in the works compiling the best of blogging about the September 11 terrorism. The idea is interesting, though I think the change in format will drastically change the impact, significance of the writing. If you scroll down the above link their is an informative post about definitions--mostly the definitional differences between normal blogs and warblogs. Turns out reading classic literature is good for business. Who'd a thunk it. Thanks to Anne Wilson for the link. A Sigma Chi member was apparently assaulted by a ATO member. I am going to be covering the story for the paper and am not sure what I will find. The Sigma Chi is apparently pressing charges. I was told of the affair by a Sigma Chi who works for the newspaper. I'm looking into it Monday and plan to interview both parties, police, the dean of men, Frat advisores, etc. We'll see who else turns up and who else I can talk to. I may get negative reactions from both fraternities, people in favor of the Greek system, and administrators who don’t want bad press. The story is at least an important crime story and could possibly have a greater significance. Let’s see what I find. I'm not working too much in political parties anymore, having left that end of politics for journalism, but as a Christian Conservative I certainly had to deal with the question of third parties. Chalcedon just ran a good piece dealing with the foolishness--the ignorance of how American political structures are formed. He takes some potshots, ones I think are well deserved, at Howard Phillips, the perpetual presidential candidate of the Constitution Party (formerly the US Taxpayers Party and in many states the American Heritage Party). I have read my story on Ed Carter, a student charged with stealing credit cards, over a few times, and every time I stop at the sentence: Carter took them. That was the turning point. The time and place when he made a decision that changed his life and changed the lives of those around him and it is summed up in a one-sentence paragraph. It is explained, in all its force and bite and pain and stupidity. This reminds me of the power of simplicity. I certainly believe in the Hemmingway/Orwell school of short sentences, tight paragraphs and small words. The most reliable, solid words in English are the words: “said,” “and,” “the.” I rely on stable words, good words that have a history of sturdy and unflowered communication. I am a journalist. I believe in trim sentences and solid words. They carry the weight that gets hidden in the bushes of complicated prose. I went to the courthouse the other morning to attend the sentencing of Hillsdale College student, Edward Carter. I saw again why writer and journalist Tom Wolfe recommended that good writers and writers who wanted to be good turn to the crime beat. No other beat is so full of humanity and pathos. In 20 minutes I saw four men, two young and two old, come into the court at crisis points in their lives. The young men were there for drugs and the old men were there for alcohol, all of them were there because they had messed up their lives and the lives of those around them. All of them were facing consequences and facing the future, promising things would be different. I realized, sitting in this little courtroom in a little town in the middle of nowhere of any significance, that I was watching the stuff of great literature and drama. This humanity is the stuff of Dostoevsky and Steinbeck and any other writer who wrote and wrote well of humanity, of fallen men. The crazy journalist who wrote for Rolling Stone Magazine in a style called Gonzo Journalism, Hunter S. Thompson, described it this way: "I have spent half my life trying to get away from journalism, but I am still mired in it--a low trade and a habit worse than heroin, a strange seedy world full of misfits and drunkards and failures." I wrote the story of Edward Carter under time constraints, but it was a great story, full of drama. This was the second story I wrote about him, the first being after his arrest. After that story, I received a phone call from an unidentified male who told me I was a soundrel and promised to physically hurt me, a promise he hasn't kept. After this story I got a much better call from a female student. She was a bit upset about the story but was cordial and wanted to understand what makes something news. She asked some good questions and fundamentally wanted to know why one personal thing was news and another personal thing wasn’t. I explained the news criterion and dealt with example she wanted to talk about. I told what a reporter’s purpose was and why I write some stories that make people look bad and do in with a good conscience. I told her about the journalistic code of ethics and she was happy and felt she understood and said she was going to explain it to her friends who were talking about the story. When I was talking to her I thought about how I called the best friend of a dead 16-year-old and realizing he hadn’t heard that his friend had been shot with a .45 during marijuana deal and I heard the boy crying. I knew then what life was and what pain was and what empathy was. I touched humanity in its fullest. I tried to put all of that into my story about the dead boy. I could have done a better job. With every story I am trying again. I am waiting for the next story, waiting to catch humanity and render it in ink. Razormouth has an interesting and informative piece on the weed. Not that weed. The old kind. Pipes are popular here, especially among the more intelligent, academically minded students. The image cut by a pipe smoker is certainly an intelligent one and an attractive one to someone like myself. I'm told the health problems and the costs are significantly less than cigarette smokers because the smoke is held in the mouth, not the lungs, and the smoking of the pipe is an occasion--something done at most weekly by these students, not the hourly inhale of the cigarette puffers. I did it. Writing two papers and producing one hard news story and all the other required things, I still managed to save tonight for the philosophy lecture and the discussions and party and the head of the Philosophy/Religion department’s house tonight. I went 72 hours only sleeping for nine, but everything was accomplished and I am still all here—a little strung out but all here. The lecture was by a physicalist (know as materialist but, with this name, not to be confused with other materialists of other fields) on physicalism and dualism and trying to moderate a new theory answering the problems inherent in both. Everything was very fascinating. I am catching up, and thoroughly feel to be learning large portions. I feel to be a fish in the right capacity of water, forced to compete and play the field, not falling into dominance by default. I love the philosophy faculty and certainly enjoyed coming more into their acquaintance, moving into their circle. This is a large part of why I chose this school and experiences like this confirm I have chosen well. When my brain is firing steadily again and I have slowed done a bit I hope to post about the philosophy of the mind controversies. Seeing that corrections are a function of having readers, I consider this, my first corrections blog, a good thing despite the mistakes or oversights I am correcting. Post Fairfield: Amanda, the art major who spoke with me after my presentation, liked my presentation and was sympathetic to my critique of Hillsdale, noted that she wasn’t the only art major attending. Another art major, Mike, was present for the second half of the presentation and the discussion. Reporter’s Advantage: Jonathan Nikkila, Collegian Managing Editor, who I didn’t know Knew about my site, pointed out that he wasn’t so much surprised that a reporter got the documents. (“Well, I was a little,” he admitted. “I didn’t know they were that public.”) As an editor of a collage paper where students must be goaded into writing stories and fed ideas for stories he was gladdened to see me bring in a good, interesting and investigative story that he hadn’t heard of or thought of. Consider him not, then, surprised, but laughing from gladness and feeling vindicated by seeing a good job done. Fair 'nuff. Modern man has stuck his head outside the inverted bowl of order, seen the functioning chaos of the universe, and found he did not need God. The cosmos runs distinct of and independent from a sovereign Being, and God is painfully irrelevant. In this departure from faith, this retreat of God from the world, man has lost the things that made him human. Seraphim offers an interesting paragraph on the latin phrase. He's always continuing our language education. Well done. It was, during the chivalrous periods—the Middle Ages—when armies had banners, a white flag. In the great wars, the American Civil War, WWI, WWII, it was the raising of both hands to show that you didn’t carry a weapon. Today, in the total wars of terrorism and civilizations wars against terrorism, it looks like the new universal sign of surrender is the raising of your shirt, showing your hairy stomach isn’t strapped with explosives. Will the new cry be “Drop your gun and pull your shirt up”? I think this new sign of surrender reflects the symbolic state of our world, I’m just not sure how. I'm becoming quite the creature of the night. Last night was an English research paper drive and I was working hard until 4 a.m. But it was sorth it because things came together. Tonight I have a history paper--a shorter piece, thankfully--and expect another late one. The only thing making things worse is I have to attend a trial for the school paper in the morning, 8:45 a.m. But I will pull off a good paper on modernism and write two interesting news stories for this weeks paper, hitting the campus Thursday. Perhaps the greatest thing about being a reporter is the opportunity, or task, of asking questions that others wouldn't of couldn't ask. We are the people who ask the bereaved to tell us about the dead, who ask the powerful for explainations, who ask the shamed for their stories. We ask for details and for background and for stories and pasts and for sensitive and personal information, and people answer. This morning, before class, I walked into the schools treasurers office and asked for the College's tax report for the fiscal year ending in 2001 and the one ending in 2000 and was given photocopies of the report. An editor, sadly enough, was suprised that I was given the documents, since they are a bit sensitive (though public). In a way I understand his disbeleif, I approached the institution and asked how much money it was bringing in and how much it was paying out. And I was given an answer. This is the heady stuff of journalism. The new New York paper is on the streets this morning. The paper, headed up by publishing success Seth Lipsky, is intended to give more solid city coverage and a conservative slant (similar to the Washington Times, but without the Moonies). Working with these guys would be great. I wrote asking for an internship this summer, but of course that was a bit insane and they didn't take me up on the offer. I will try again next year. Trying to beat the NY Times in covering the city on a daily basis would be a real high. It is hot tonight, stuffy and humid in an early Midwestern spring sort of way, without a breeze to break things up. My dorm room door is open, trying to create a draft of air through my room and to the open window at the end of the hall. The hall is silent, lit a pale red by the glowing exit sign over the stairway. It is late, 3 a.m., and everyone is asleep on my hall, preparing for the jarring sounds of the alarms that always come too soon. My roommates in asleep in the top bunk, curled up and with his face toward the wall. I see the frame of his skiny naked back and his thin curly hair lighted by my laptop. He rolls over. “So where am I going to go?” he asks in his sleep. He rolls over, away from the light of my moniter. I am awake. Working on an English paper that was slow coming into shape, a paper that is finally working in the late night drive, I listen to Bob Dylan’s first album through headphones. A very strange blog. I'm not sure if this is funny, effective satire, or a serious abuse of weblogs. It does seem to be trying to carry the joke so steadily and so far strains it a bit. An interesting site on Catholicism by a devout Catholic and former priest named Michael Dubruiel. My presentation to the Fairfield Society on the nature of art went okay. My talk (about 20 minutes) wasn’t what I wanted. It was poor rhetorically, coming more in the form of an outline or a statement and less in the form of a speech. It was, however, concise, which was valuable. The discussion afterward was good (it is not strictly a question and answer period because the floor is pretty open and the speaker is not the only one answering questions). I had to deal with the questions I expected, questions on my art definition, and also with some issues I had never thought of, some of Hegels opinions, questions of progressivism, the internationality fallacy, and others. One art major came. She seemed to be in general agreement with me and told me she enjoyed the presentation. We talked a little afterward and she said she disliked Hillsdale art because of its lack of emotion. She apparently hadn’t read my editorial or known of the controversy but when I told her my thesis had been that Hillsdale art is safe boring and predictable, she laughed and agreed with me. I'm looking at U.C Berkely as a Grad school I would be interested in attending if I go for my Ph.D in philosophy. I've been having some philosophy days recently. I've been reading about the 20th century history of physics in the book The Second Creation, and I am attracted to the ivory tower I see. Maybe I'll count the number of days in a year I'm leaning toward one career and the number I'm leaning towards another and go with the one I lean towards more often. A pro-market story in the L.A. Times showing how private businesses, now training the Afgan armies, are a better alternative to the Government doing the same thing. These guys are one step from mercenaries, and pretty cool. Story number two, the faculty fight surrounding the bestowing a honorary degree on comencement speaker Dr. Laura, has died. The faculty voted to confirm the honorary degree and thus has rubber stamped the administrations decision. As bad or crazy as the idea might have been it is no longer a controversy. I talked to the Dean of Faculty today and he confirmed that the policy of those meetings is the exclusion of all non-faculty. They want to talk openly and have their controversies well concealed. I understand this even if as a journalist closed meetings gall me. I have recently finished The Milagro Beanfiled War, a good if long book, by John Nichols. The book, as I mentioned before, has the feel of being something handed down through the oral tradition, that is to say it captures well the air of the Mexican-American culture of the Southwest. Onofre paused, blinking as he tried to focus on Bernabe. Bernabe felt like laughing, yet instead he set his face in a glower, hoping to drive this one-armed poet back into the heart of the revelry where he belonged. But Onefre was only just getting started. Flinging his visible are starward he babbled on: “We got the Angel of Leaky Outhouses up there, and we got the Angel of Overgrazed Pastures up there and the Angel of Always Being Broke up there—why, we got so many offbeat grizzled angels floating around over this little town that sometimes I get claustrophobia from all their wings rustling—from them that have any feathers left in their wings, that is. And from their stink, too. Why, I bet there ain’t another town on earth with so many sweaty angels hanging around on top of it. There’s the angel of Going Crazy up there, and the Angel of All the World’s Cripples. You ask me, this town is like a pile of horseshit attracting every kind of ugly fly and winged insect in the neighborhood, only what we got every kind of deformed, outcast, feathered ghoul from heaven looking after our people and their earthly affairs. Lame, half-blind, one-armed like me, retarded—you name it. This place just reeks of crippled glory!" I've been beating my head against a research paper for four days. It just doesn't want to be written. Actually I think I am intimidated by this professor, a hard, hard man who believes good teachers don't give out good grades. I'm working on a journalism topic I am interested in and should be fine. If only I wasn't writing for him. I think I will have to ignore him and the "research paper" aspect of this paper and just write the blasted thing. I have recently been told that I have the News Editor position on the Hillsdale Collegian next year. I will be in the number two position on the paper under Seraphim, fellow journalist, student, blogger, etc. If I keep mentioning him I am going to have to come up with a shorter description. I look forward to holding the position. I will be glad to be in the editors seat again. I’m working on three large stories for the school paper this week (making my life crazy though I enjoy the craziness). I’m following up the story on the student who was arrested for stealing two credit cards from a fellow student. He will be sentenced Wednesday morning. The guy was charged with five felonies but it looks like he will be convicted for the bit (1 ounce) of marijuana they found in his pocket and let off the felonies. Such is justice. I’m going to do a numbers story on the college’s finances after I receive their tax report on the 15th. I should be able to do some interesting stuff on the increase or decrease of the endowment, the salaries around the campus and other such information. I’m uncovering a faculty fight with the administration surrounding the move by the administration to give Dr. Laura Schlessinger (this years graduation speaker) an honorary Hillsdale doctorate. The administration want to give her one (the give away quite a few, mostly to big donors or people connected with the school they want to claim) but the faculty doesn’t see why she deserves it. We are paying her well to speak here. I wasn’t allowed in a faculty meeting this morning but I think the faculty passed something against the honorary degree. Because they didn’t let me in I have to write the story the hard way and hope to get in quite a few interview with faculty tomorrow. At last things are hopping. I am either going to stay with journalism or shift into philosophy, earning my PhD and become a professor. I haven’t decided which and am continually weighing the two futures against each other. I love journalism. I have been a journalist at two school papers and one daily. It looks like I will write for that daily again this summer. My time has been exciting and diverse and I have covered important stories. I love the variety and the daily influence in the workings of society and the pressure from the deadlines and the stories. I love philosophy. If I go for a few days without a discussion of substance I miss it and look for intellectual stimulation. I love dealing with the big ideas that form the foundations we live on. I love to take ideas back, finding their origin, and extend them out, discovering their consequences. I would be good at either profession. If I go with philosophy I might imitate my heroes, impact the culture in a lasting and immediate way and influence the generations of the future. But I would miss journalism. I would miss the immediacy and the push and press of the daily and the adrenaline. I would miss the force of the written word and the ability to inform on a daily basis. But if I had all that I would miss my philosophy; I would be sorry to see it as a mere hobby, something to do on the weekends. The strange thing is I mentally shift careers from day to day. Some days I feel like a philosopher and I want to spend my life dealing with interesting epistemological questions of discuss the philosophy of science. And then I wonder if I would miss journalism every morning when I picked up a newspaper. Other days I feel like a journalist and the fire is in my belly and I am hot on a story and I am breaking news and directing the public conversation. I am certainly undecided. Maybe I’ll make a move one day when I am feeling a tendency toward one career, and I will do that for the rest of my life. Maybe I’ll find a way to keep both parts of my interest central to my career. Maybe (probably) I will get an offer somewhere and then I’ll just take the offer. I really don’t know how this is going to happen. "From time to time, as we all know, a sect appears in our midst announcing that the world will very soon come to an end. Generally, by some slight confusion or miscalculation, it is the sect that comes to an end." Thanks to razormouth.com for the quote. Seraphim, fellow student, blogger, journalists etc. answers an e-mail of mine questioning his comment about the relationship of physics and philosohy. As someone majoring in philosophy and fascinated by physics and currently studying the philosophy of science, I enjoyed and agreed with his answer. Thank you for your letter. I appreciate the way you have handled your disagreement with me both in our discussion and in your letter. The way you have responded reaffirms my choice in Hillsdale College. Even if we disagree I appreciate that this has been discussed with openness and reason. You asked me how is art progressive and how progress is to be measured. I am afraid the answer will not be as brief as the question. I’ve been criticized for my spelling on the site, which is certainly fair. Mostly the errors were typos—dropping a letter or transposing something—but it was sloppiness anyway. I am a big supporter of copy editors. I have trouble reading my own work immediately after I have written it. With newspapers this is fine because after I do my best and catch what I can a copy editor, a page editor and a news editor. Alas, no such safety net system exists for blogs, papers or other daily writing. I am now typing in word and pasting over to my blog and, while nothing I’m working on will be perfect, with the advantage of my automated copy editor we should stop the slips from coming through. "Scores of monkeys have swamped a girls' college in the hill resort of Darjeeling in eastern India, destroying thousands of books, stalling classes, clawing and slapping the students," the Indo-Asian News Service reports. "The monkeys have torn to shreds at least 6,000 books in the library and broken furniture. The damage to property caused by them exceeds Rs.60,000 [$1,200]." Local authorities "say their hands are tied as local residents oppose any action against the monkeys, considered scared by Hindus." Now why couldn't we get a break like that at Hillsdale? How come we couldn't get a story like this? Oh the headlines we could have if only we lived in eastern India! Working out my schedual for next term's classes and preparing to preregister. It looks like I will be taking begining Latin, art history, prose writing, Dante's Divine Comedy, Greek Orthodoxy, and New Testament Ethics. I think our Midwestern winter may have broken. It is supposed to be in the 60s all week and today we are having an enjoyable, steady drizzle. It is raining in the comfortable way--contemplative and relaxed. It is the kind of day to read a book or have a long talk. The natives here are complaining about the rain. They like the snow, live with it and consider those unused to it strange and soft people, hidden from the reality of life. They curse the rain because it is wet, because they have to carry umbrellas or raincoats, because it slows the pace of everything and makes the earth beneath their feet quite sloppy. I love this rain. It is warm and gets one only a little wet. It feels like a nice winter day in Seattle or, closer to home, Port Angeles. It is not a force of nature with violence and destruction. It is easy to live with this weather, easy to swing into the slower mood of a rainy day. It is a day to settle into a big chair and read a book, a day to listen to the patter of the falling water, a day to feel it on your upturned face. Back home we had our own doomsday prophet. Mr. Dobbs ran a copy shop but his real passion was the end. He predicted (constantly) that a tsunami, created by the earth's shifting plates, was going to wash out our Olympic Peninsula. In his spare time he talked about ice ages, mastrodons, global warming, earthquakes, asteroids striking earth and all that good eco-horror. Now their is a NASA created doomsday site for all those with an unquenchable interest in the possibility of coming doom. Andrew Sandlin has an excellent piece today on the assets and liabilities of the Reformed Church. He has good points and they will benefit those of us willing to work with them. A great story about a great man: a tough Spanish judge, a law-and-order Leftists, a man fighting crime, corruption and injustice. Having grown up with at least one clock in every room, this article was delightful. While I'm on the topic of Catholicism I might as well touch on the topic of the next Pope. I heard recently from some of the Catholics on campus that the most likely candidate to become the next Pope is a Bishop from Africa. This story confirms that, but suggests that a South American Bishop may have the upper hand. The question of race is a novelty and is really of little importance to the qestion of the next Pope. What is of vital importance is the conservatism among the Christians and the Catholic Bishops in Africa and South America. This could be a great benefit to the Catholic Church and Conservatism in world politics. Of course, a black coservative Pope would probably be villified by Liberal American Blacks. I volunteered the word in American History yesterday and got an unexpected response from my (Catholic) prof. We were in the early 1900s and talking about Tammany Hall, the Irish New York political machine, and its consequences in opposition to immigrants, particularly Catholics from Eastern Europe and the Mediterranean areas. She moved to the religious bias of the time and was searching for a word when I volunteered "popery." My prof. thanked me, agreed with me, and then said she doesn't like to use the word. I was a little suprised, knowing the word was prejorative but not thinking of it as particularly offensive. But she may be especially keen to the offense becase she wrote her thesis paper on the history of anti-Catholicism in America. Dr Brendan Comiskey is resigning from his position as Bishop of Ferns, Ireland, as a result of the current sexual scandals in the Catholic Church. He seems to be a good man, geuinely distraught over the reality of the abuses, the grevious sins, that took place under him and that he didn't do enough to prevent. I read that the man, who will now serve as a priest, was the most popular Bishop in Ireland and now we are seeing what seems to be the repentence of a contrite man. I am disturbed by the quandry of what happens to the quality of Bishops in the Catholic Church when good Bishops resign, as they ought when in Comiskey's position, leaving the Catholic Church in the hands of the Bishops who continue to willfully ignore the situation or worse, to participate. Resigning seems to be the right thing to do, but it is those Bishops who desperately want to do the right thing that the Catholic Church desperately needs to remain in positions of authority. Derbyshire writes an excellent piece skipping all the platitudes offered since her death. Republicanism (in the old and European senses) and Americanism and general anti-monarchy sentiments shouldn't be so easily swept away. I laughed when I read that he gave one of his sons the middle name of Oliver and think I like Derbyshire better now. It is a strange feeling when College begins to feel like home. I eat two meals a day with the same people seven days a week and they have become part of my life. I have a place here, at school more than half-way accross the country from where I live and where I have lived. I have a place with my friends and my books and my teachers and my work on the paper and everyother piece of college life that has been intergral to my life for the past year. My friends from home on the West Coast respond to the phrase "Toledo Art Museum" with the one sylable question: "huh?" That was my first reaction too, but I'm enlightened now. Despite our disbelief Toledo has a fine art museum. The highlight over break was my trip to the Toledo Art Museum. The modern collection is small and a bit eclectic--two pieces by Picasso and one by Andrew Wyeth in one exhibit--but the art from the Middle Ages and the Renaissance were terrific and thorough. Perusing the Renaissance exhibits in the gallery I was interested in the differences between artists of different countries. Art from Holland seems to be the solid, well established art of the time, with Rembrandt leading the school there. Art from Spain and art from France seem to be less firm in there idea of art, a little more wavering and unsure of itself. I bought two little books, trying to maintain and beef up my art education. One is on Picasso (an artist who has really stirred my curiosity, perhaps in part because I have seem him villified but I like the ideas he was attempting to portray) and the other is Rembrandt (see earlier post). I present on art to the Fairfield Society on April 15 and am busy preparing to defend my aesthetic views. A good story from the L.A. Times about children's education. Dealing with the problems, dropping the fads and the guess work and the good ideas and teaching children how to read, assuming that reading is enjoyable. Watching Andrew Sullivan, the folks at National Review and the folks the Weekly Standard batting around the thought of Condi Rice as a running mate to replace Cheeny has been interesting, even if they are pretty slow to pick up this idea. Some of us have been pushing Rice since she was first mentioned for a cabinet position and pushing her for veep ever since we realized Cheeny wasn't up to the long run. When discounting Rice they talk about the historical fact that noone has dropped their veep from one term to another in a very long time and, if you discount Nixon, noone has voluntarily dropped their veep in a very very long time. The historical case they mention here is Quayle--it is fun to speculate about the new veep and becomes the hottest political party game, but it isn't likely to happen. The pertinent point all the commentators seem to have missed is the question of succession. Veeps fill the role of continuing the admnistration, they are the heirs apparent. Cheeny won't run for Pres., giving us a strange situation in 2004. This one serious reason Bush needs to consider a replacement but it is also a reason the commentators have overlooked. My opinion piece was agressive and provocative and blasted the art here at Hillsdale College, but level of critique seems to come with the territory. Check out the recent piece on modern artist Gerhard Richter in The New Republic. character named Blogg and one named Bloogs. I learned to read on Dr. Seuss, love him to this day, and attribute at least part of my understanding of rythm and timing and great writing to him. Chaim Potok, the author of the chosen, in an interview was asked about children's lit. and gives a great response, plugging that veritable master of masters, Dr. Seuss. the genre of the children's book to an art form." The Christian Ghettos of the Evangellyfish and their fear to engauge the world and their insistance on Christianizing trash that should be thoroughly replaced. Faith, leading us to action and submission, a life not a single act. Credenda Agenda has published another issue that looks interesting. Infant Baptist defended in the first of a two part series on the subject that looks to be fairly staightforward, traditional defense of the doctrine.